I had the chance to play twice this week and in both sessions, I revisited games that I had played recently, namely Keyflower and Puzzle Strike. Both titles got stuck in my head the first time I had a chance to bring them to the table and this, for very different reasons. One is a very thinky game where you need to adapt to what is available at the moment, the other is more of an optimization game where you need to build up your deck in order to beat up the other player. Part of the reasons has to do with how little downtime there is in both games once you know how the systems work. Neither of them have very complex systems, but the decision space and the consequence of these decisions can be quite complex and have very deep ramifications, and this for different reasons. 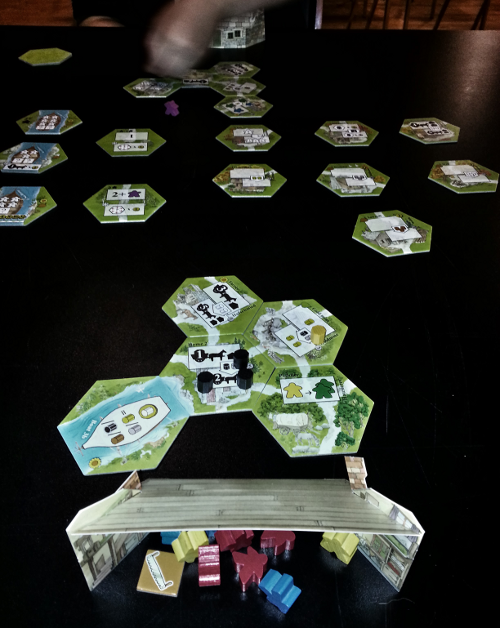 I played Keyflower (Game Salute) by Sebastian Bleasdale and Richard Breese on Wednesday night at the Ubisoft Montreal game night. I wrote extensively about it last time, including a fairly thorough rules overview. We were three players, with Mike having played the week before and Stephanie having seen part of the game, but hadn’t played. I went quickly over the rules with her and within 15 minutes, we were off. 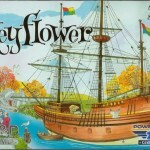 Keyflower is one of these games that once you’ve played, you get a much better idea on how to explain the rules since the rule book, while organized in a very linear fashion, is still slightly confusing. This time, I decided to start by showing and explaining the Winter tiles before explaining the rest of the mechanics. Knowing what the end objectives could potentially be helped solidify what the players were aiming for. Also, I noticed that it is, at the core, an extremely easy game to grasp. The true difficulty still lies in how to reach your objective, not how to do things. Still very impressed with what was done with such a simple ruleset. We also used the Emporium & Monument bonus tiles, which add two extra Winter tiles to the game. They don’t impact the game all that much, but they do add a touch of flexibility, especially if you want to focus on Meeple management. Next time, and there will be a next time, I’d like to try the Key Celeste expansion. I suspect that it will make more of an impact on the game. So, with the rules out of the way, away we went. The game went at a very good pace, concluding in a little over an hour(! ), including rules explanation. In general, there were less tiles that were up for auction being activated, except when the player was fairly sure to be the one who would win them, and overall less tiles being activated that didn’t belong to the player. 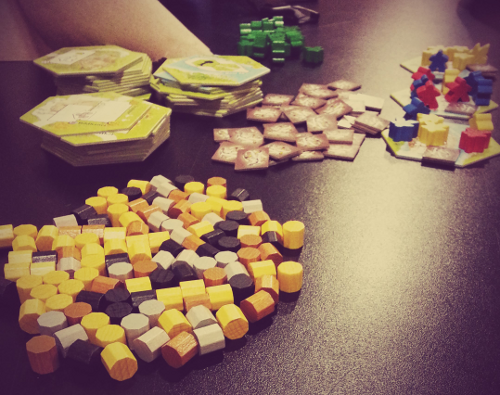 This meant that people ended up with more meeples, which made for a very production-heavy last turn. The dynamics were definitively different this game. Because the Winter tiles I got were very Meeple oriented, I focused as much as I could in getting more Meeples on my side, but I still managed to snag 3 of the “no resources, just points” tiles in Summer, which somewhat shifted my strategy. Once more, Mike’s village was the largest, which gave him tons of opportunity to score points. In the end, Mike won with 72 points, less than 10 points ahead of me, with Stephanie coming in last with less than 50 points. The scores were much higher for the players who had played before, since we knew what to expect from each of the seasons. It was interesting to see that Mike never bid on the player’s turn tiles, and as a consequence, always grabbing the last boat. I really enjoyed my second game and the experience showed. I think it’s one of these games that first time players might not really have a chance against people who have played before. Thursday at lunch saw the return to the table of Puzzle Strike (Sirlin games) by David Sirlin. I’ve talked about Puzzle Strike in the past but haven’t gone over the rules in details yet. I’ll be doing a double-feature review of it and its sister game, Puzzle Strike Shadows very soon. At its core, Puzzle Strike is a deck building game, but one where you need to knock out your opponent in order to win, which in and of itself already makes it different. Also, the fact that you gain a gem, which is how defeat is measured, at the start of every turn, gems that you can send to your opponent’s pile and that you need to buy a new chip to your discard pile at the end of turn also mean that you can’t sit on your hands, you need to be very active. 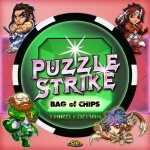 Oh yeah, did I mention that instead of cards, Puzzle Strike uses chips instead? Still not a 100% sure how I feel about that. The chips are nice and heavy and do feel good, but it’s a little bit more of a pain to set up and the font is tiny! Still, it doesn’t really detract from the game. So I squared off against Benjamin once more. As he had played once already, all he needed was a quick rules refresh and we were off. We picked our fighter (he used Grave Stormborn, I used Garus Rook) and took our chips. Grave Stormborn is one of the more “basic” fighter, being able to use his Reversal to either gain extra chips or to use as a Gem Crash when attacked; his Martial Mastery to upgrade his chips for free; or use the Versatile Style to gain whatever is most needed at that point. Garus Rook is all about gems: Stone Wall either lets you gain a chip and store one or as a reaction to simply ignore any one attack; Big Rock allows you to trash a gem chip and gain one of +1 value; and Strength of Earth increase one gem in your pile by 1. My strategy was simple: improve the gems in my hand to gain more Gem Crashes or Combine and increase the value of the Gems in my pile to get to a 4 value unblockable Gem which I could then Crash. I was able to do this fairly easily in the first match, as Benjamin was still trying to get his head around the game. The second game was a little different. We used the same setup, meaning that we knew better what worked and which way we should go. More diverse chips were bought, with the Recklessness chips selling out quickly. Benjamin figure it was ok to take wounds as he would be able to get rid of them using Martial Mastery. 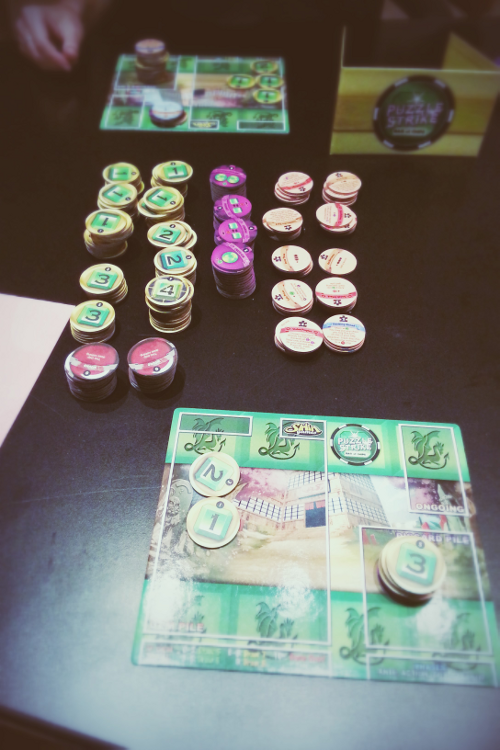 This game went on for longer than our first game, with our gem piles wavering between 4 and 8 gems. I was able to gain an edge, sending two 4-gems crashing at Benjamin on two consecutive turns and stealing one of his combined. I ended up winning that game as well. All in all, the game has a great amount of replay value due to the different fighters and all the different chips. I’ve just received the sister game Puzzle Strike Shadows and the chips and fighters in that set are even crazier. Can’t wait for it to hit the table, in combination with Puzzle Strike or as a solo game. This entry was posted in Session Report and tagged keyflower, Puzzle Strike on September 13, 2013 by TopDog.